Mass Effect 4 game is under a great veil of mystery, but from time to time rare rumors are still reaching us. Today we got interesting information about two new races in the upcoming action-RPG and a few other details that are coming from one of the game's fans. The guy from the fans' forum has published a little bit strange post. He claims that the game's producer has chosen 21 gamers from the ones who have sent him an e-mail and allowed looking at several concept arts. The first group of them describes the brand-new race with the code name "Arrogant". Those creatures are extremely skinny and even look like a skeleton covered with skin. Their eyes are glowing, and they remind of "aliens from Independence Day". The second race is described as "Ancient, Advanced, and Guardian". They have sleek metallic skin with luminous stripes on it. Also there were several concept arts that show the other races of the game - asari, human, salarian. The new engine has given them the second birth, and our source says:"they looked amazing". Moreover, the developers want the representatives of any race to get the features different from each other. The last group of concept arts showed the vehicles designed for various environments. And there were a lot of them! 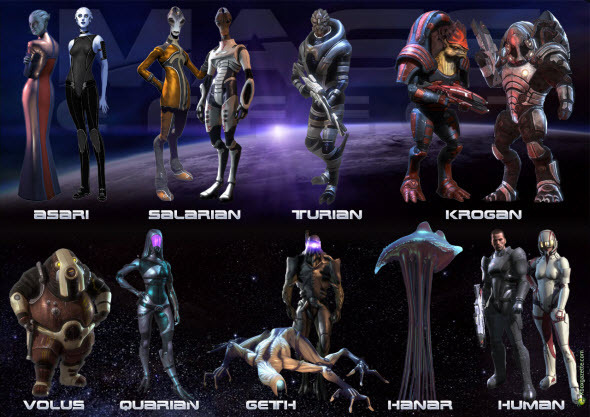 It seems that Mass Effect 4 won't be a prequel to the series, because in this case the developers don't need the new races. And what do you think?